I submitted 2 unsuccessful ARPS panels based on urban change, in which the individual images were there or thereabouts but they did not make a cohesive panel. 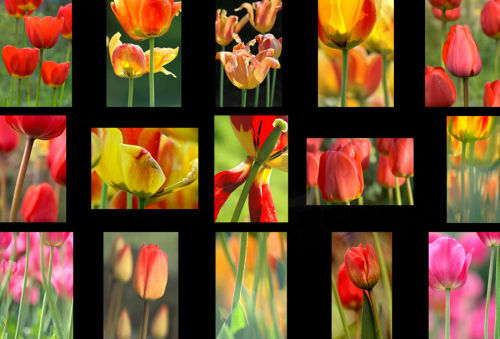 This, my successful panel, is made up of images of tulips at all stages of flowering, from buds to the final death throes. I selected the photos from ones which I had already taken and I didn't need to take any shot just for the panel. They are all close up photos taken in 3 locations, Harlow Carr, the Valley Gardens and my garden and I selected from a limited colour range. This meant that the panel had a uniform look, though some possibly better individual photos were excluded. The final placement of images within the panel also had to be carefully thought out with a balance of colour and shape being needed.